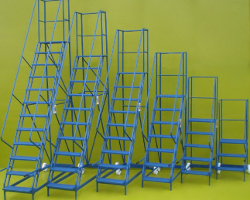 Steps and Stillages provide both spot hire and longer-term rental solutions to suit each customer's individual needs. A substantial quantity of short-term rental cages is held at Kettering and available for cover of peak business periods. The hire term can be as short as one week, for perhaps a Bank Holiday weekend or business relocation, or for possibly twenty weeks, such as the lead up to Christmas. Steps and Stillages can manufacture new equipment for longer-term rental contracts of typically three to five years. 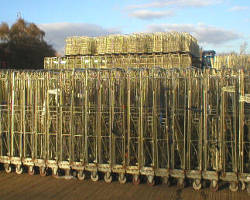 This offers customers significant benefits within their distribution system as rental equipment can be manufactured to existing specifications ensuring total compatibility with current handling equipment. The rental contract, including, if requested, a comprehensive maintenance service, is tailored to suit a customer's requirements with an agreement that suits both parties.